I’ve been looking for some simple recipes for dishes to make for MOPS brunch. Usually I sign up to bring fruit, since it’s easy and we love fruit. 🙂 But I wanted to try some new things this year. This French Toast Casserole recipe came into my inbox, and it looked simple enough. I personally don’t know how this tasted because I brought it to MOPS, and I got called to work in the 2’s room. When I came back at the end of the meeting, it was all gone. I got a small piece that got stuck to the side. It tasted pretty good, but at that point, it had been the previous night’s dinner since I last eaten, so anything would have tasted pretty good. Looks like everyone at MOPS gobbled it up though. I will have to make it again. Melt 1/2 cup of butter and pour it in the bottom of the 9×13 casserole dish. Lay 6 pieces of white bread on top of the melted butter. Mix 3/4 cup of brown sugar and 1 teaspoon of cinnamon. Pour half of the brown sugar mixture on top of the first layer of bread. Add the second layer of six pieces of bread over the top of the brown sugar mixture. In a separate bowl, mix 5 beaten eggs, 1 1/2 teaspoons vanilla extract, and 1 1/2 cups of milk. The next morning, cover the casserole dish with aluminum foil and then bake at 350 degrees for 30 minutes. Uncover and bake for another 15 minutes. dust with powdered sugar. *Bold instructions can be done by younger kids. This entry was posted in What We're Eating by Joyce and Norm. Bookmark the permalink. I love this idea. 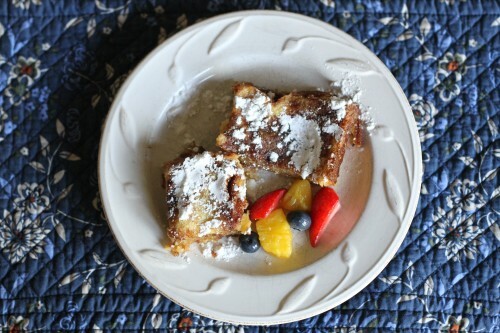 We love French toast, I might try to finally make something like this!